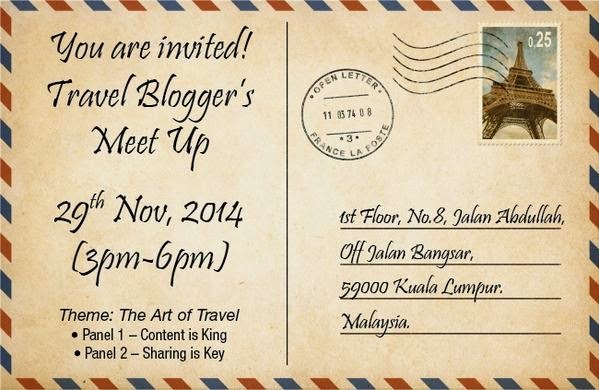 Are you a Malaysian travel blogger? Or a travel blogger based in Malaysia? Or would like to be one? If you are one of these, do come and join us at our third meetup on Saturday afternoon, 29th Nov 2014. Cost - It's FREE, thanks to our sponsor, Sedunia Travel! The theme for this meetup is "The Art of Travel" and there'd be 2 panel sessions covering travel writing under "Content is King"; and social media tools under "Sharing is Key". Like before, this is going to be a very casual afternoon where we can learn, mingle and network with not just fellow travel bloggers but also with some representatives from the travel industry. *Only those who have emailed their RSVP will be admitted to the event. Space is limited so be quick! P.S. You can also check out the meetup's Facebook event page. Eh? Ingatkan dah habis study? Will reserve my seat too! Missed the earlier meet up! Aiseh! Tak apa, insya Allah next time ada lagi. Enjoy Genting! Yup, unfortunately a few of us were either travelling or away. Tu lah, nampak gambar menang lucky draw hotel kat Bangkok. Sungguh kurang sopan. Hahaha! Ha! I tak dapat pergi pun walaupun dah register. Ada something came up, heh! Rosmaria ada pergi, ada nampak dia dalam gambar.